A comforting bowl of homemade soup made in 30 minutes. It is possible! This Broccoli Cheese Soup is an easy, one-pot vegetarian meal that is gluten free too! Homemade doesn’t have to mean complicated or time consuming. Some of my favorite recipes are one-pot 30 minute meals. I am especially a fan of recipes that require very little prep. Come on, chopping veggies is tedious! That is why I have a freezer full of vegetables. Frozen fruits and veggies are convenient, affordable and nutritious. Oh and, they come pre-chopped . . . Bonus! 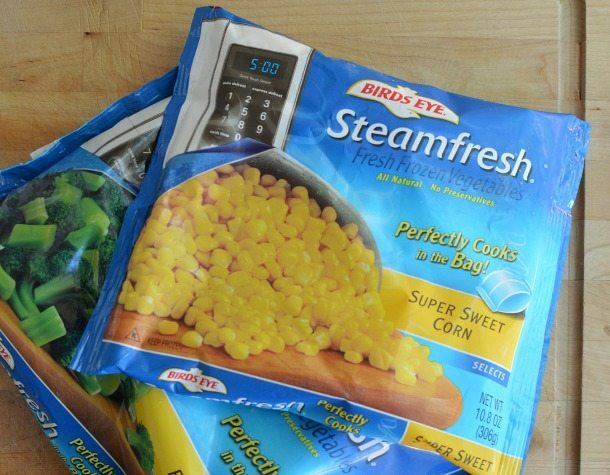 Frozen produce is such a time saver. I also don’t have to feel bad about throwing away fresh fruits and vegetables that go bad before I have a chance to use them. I hate wasting food. My freezer is always stocked with frozen broccoli, carrots, corn and (my personal favorite) chopped onions. 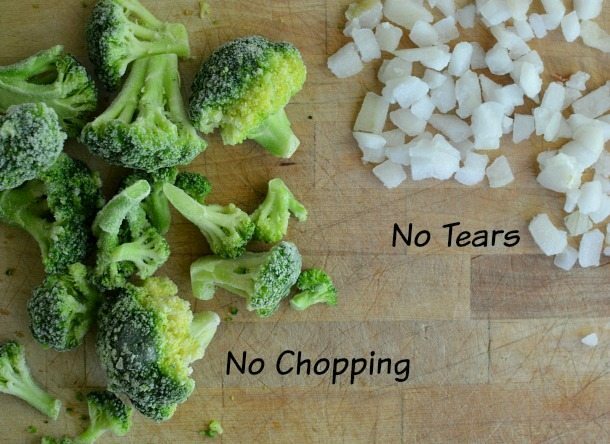 You know how everyone has a trick to keep from crying while chopping onions. Well, my trick is to buy frozen chopped onions! Not only do I not cry . . . I don’t even have to chop them! Corn and broccoli are my daughter’s favorite. So I always make sure that I have those on hand. With nearly 90 percent of Americans failing to meet their dietary recommendations for vegetables, I want to teach my daughter good eating habits early on. A few examples of quality frozen produce brands are: Bird’s Eye, Green Giant and Wyman’s. UC Davis, in partnership with the Frozen Food Foundation, conducted a study on frozen fruits and vegetables. The study revealed that frozen fruits and vegetables are most often nutritionally equal to (and in some cases better than) their fresh counterparts. Freezing fruits and vegetables is nature’s pause button! Learn More: Frozen Food Foundation Facebook, Frozen Food Foundation Twitter. 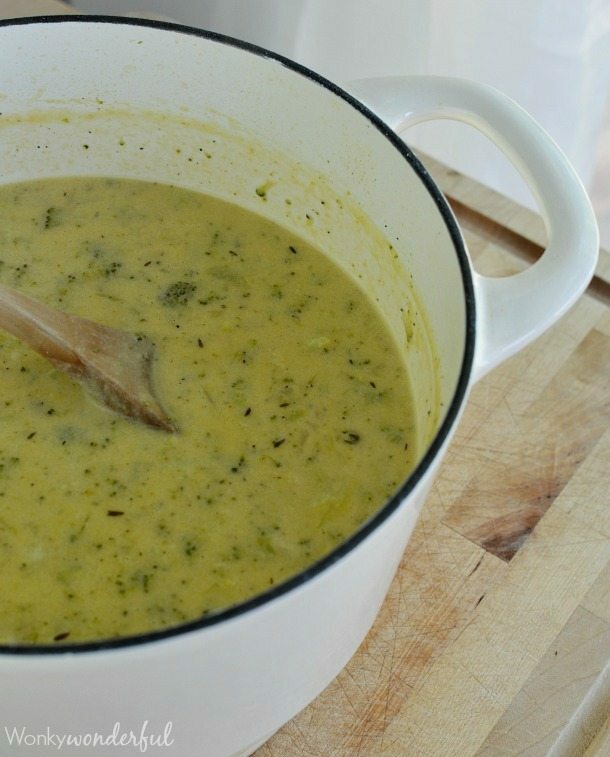 This Broccoli Cheese Soup couldn’t be much easier. If you can toss ingredients in a pot and stir . . . you can make this soup! 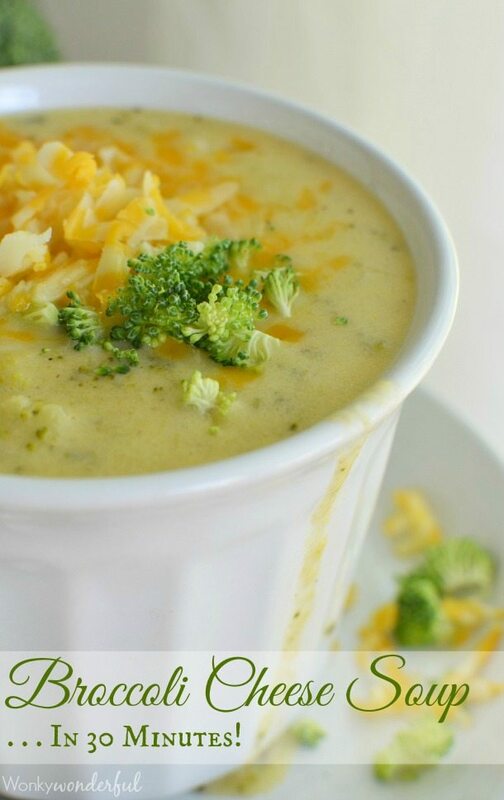 Broccoli Cheese Soup in 30 Minutes! Heat oil in a 3.5 quart pot over medium/high heat. Add onions and saute for 3 minutes. Stir in thyme, garlic powder and pepper. Add broccoli and vegetable stock. Boil for 15 minutes (stir occasionally). In a large bowl, toss shredded cheese with corn starch until evenly coated. Set aside. Serve in a regular bowl, mug or bread bowl. Top with a generous amount of shredded cheese. 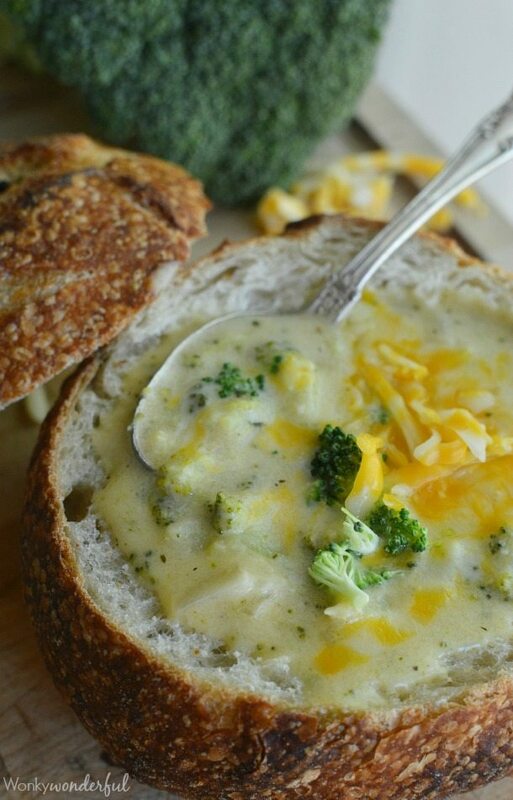 Mmmmm, homemade Broccoli Cheese Soup in a bread bowl. The perfect Fall meal! Heck yes! I made a big pasta bake with frozen veggies last night, and while I was surprised that my cutting board stayed in the cupboard…I was also totally OK with it. It was so easy! 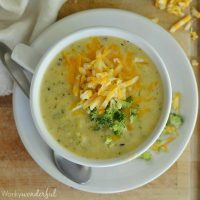 I haven’t had broccoli cheese soup in SO long and now I’m totally craving it. Thanks for this recipe! 30 minutes?? I’m sold! What a spectacular soup! That bread bowl pic? Holy yum! I can have this greatness in my belly in 30 minutes?!?! Heck to the yes! Hi Kira! I’m sorry this didn’t work out for you. I do not know why that would happen. The mixture should be hot when adding the cheese so that it melts immediately. So long as the cheese is grated and tossed with the cornstarch it should mix in fine. Just making this now and it’s turning out great. Wondering can I store this to eat another day? What’s the best way to store this? Hi Mindy. Yes, you can absolutely store this. Just transfer to a container, cover and refrigerate. I would recommend eating leftovers within a couple days. Enjoy! Thanks for simple recipe instructions(found this from a GF recipe roundup). Having the combo of spices used is super useful.